MALVERN – Before Andrew Clark came to Malvern Prep, he had only known one other kid who had cancer, but during his time at the school he learned that three students fought cancer and won, just like he did. Now, these four students are banding together to support Clark’s bid to be the Leukemia & Lymphoma Society’s (LLS) Student of the Year and raise critical funding to eradicate blood cancer. Clark, a junior from Chester Springs, is one of 10 Philadelphia-area students vying for the 2016 LLS Student of the Year Award. The student who raises the most money during the seven-week competition that began on January 11 wins a $2,500 scholarship to the college of his or her choice. For Clark, the scholarship, and even the contest, though, is secondary the funding and awareness raised to fight the number one cancer killer of people under the age of 20. 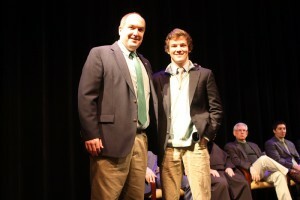 Upper School Head Ron Algeo (left) with Malvern junior Andrew Clark. Clark has been speaking to students to encourage support for his “Catch the Cure” campaign to raise money for cancer research. The money raised through Clark’s campaign will go to game-changing immunotherapy research spearheaded by Dr. Carl June at the University of Pennsylvania. Clark was diagnosed with leukemia when he was three years old. During his seven-year battle with the disease Clark became friends Mark Rodgers—the “one other kid” he knew who had cancer. Clark and Rodgers, a student at Springfield High School, shared the same doctor at A.I. 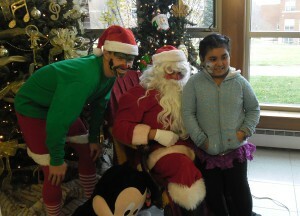 Dupont Hospital for Children. When Rodgers, who won the 2015 LLS Student of the Year award, nominated his friend this year, Clark immediately thought of his Malvern brothers. Malvern’s three other cancer survivors, Mason Abate, a senior from Malvern, Ethan Bedwell, a senior from Media, and Nick Calvaresi, a junior from Malvern, have all devoted themselves to Clark’s campaign. “For many people, Mason’s illness is still fresh in their minds. They were really affected by Mason’s illness and treatment, and they will do anything the can to help find a cure,” Clark says. On Saturday, February 20, Clark is hosting a “Catch the Cure” event beginning at 7:00 p.m. at the Main Line Sports Center in Berwyn. This family event features food, games, auctions and fun for all ages. 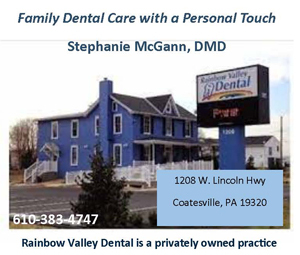 You can learn more about the event at catchthecure.net. You can also make a donation to Clark’s Student of the Year award at the site. The LLS campaign closes at Grand Finale Celebration on Saturday, February 27 at the Loews Hotel Philadelphia. 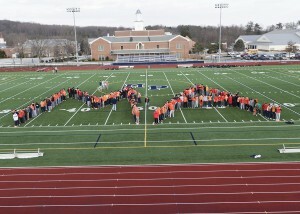 When Malvern senior Mason Abate was diagnosed with cancer his freshman year, Malvern students dressed in orange and lined up to spell his initials on the football field to show their support. Whether or not Clark wins does not matter as much the awareness he is bringing to a disease that has affected so many in the Malvern Prep community. Students have shared updates on social media and plastered posters around the school. Clark has spoken at each of the grade-level honors assemblies this month, and Calvaresi penned a personal reflection about his cancer fight for the student newspaper. Maybe even more important is that Andrew, Mason, Ethan and Nick know that they have brothers who will do anything for them. “I could never imagine what my life would be like if I did not have Malvern Prep,” Clark says.